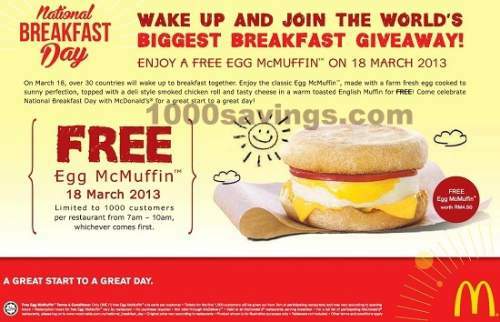 Wake up and join the world's biggest breakfast giveaway : a FREE Egg McMuffin (worth RM 4.50) on 18th March 2013! Enjoy the classic Egg McMuffin, made with a farm fresh egg cooked to sunny perfection, topped with a deli style smoked chicken roll and tasty cheese in a warm toasted English Muffin for FREE! Only ONE (1) free Egg McMuffin a la carte per customer. Tickets for the first 1,000 customers will be given out from 7am at participating restaurants and may vary according to opening hours. Redemption hours for free Egg McMuffin vary by restaurant. LIKE & SHARE out this great offer from McDonald's NOW!